The way people search for content on the internet is always evolving and this is not new. However, we are currently experiencing a shift in how Google ranks content due to the way people are searching for it. In order to keep our content on the first page of a Google results page, we need to understand how people are searching for content now, and how we can re-work our search engine optimization to better serve users and Google. Searching for content has become more conversational and searching for content is no longer confined to search engines. Live chat, social media, image search and video all impact the way we now look for information. Now, to remain at the top of Google's rankings, you will have to pivot and think of content differently. Here are a few ways you can beef up your on-site SEO in order to rank or remain ranked on search engines in 2018. The technology search engines now use has adapted to the way we are searching. What does this mean and how did we get here? Back in 2005 and 2006, we searched for information with queries that were short and to the point. For example, in 2006 we searched for auto-shops like this, "Auto-shop Maryland," but today search terms are often longer and conversational. Today, we search for information like this, "Where is the best place to get an oil change near me?". We can all thank each other for this shift in search, too. Until recently, everyone in marketing had content creation down to a science. Pick a topic, create content, jam it with keywords, link to articles without caring what type of keyword that article ranked for, publish. This way of publishing helped and hurt us. It created a large quantity of content for us to use, but it also made helpful content harder to find. This is when long-tail keywords came into the picture. Long-tail keywords were then used to search for more specific content, generating longer search queries. As marketers, we then started implanting long-tail keywords into our titles, H1, H2 and meta descriptions, we even started to add "no-follow" tags to hyperlinks that sent people to sites that contained information we did not want to rank for. This shift began to balance the quantity and quality of content that was being published while impacting the way we search for content. There is still a shortage of quality content on the web, so don't think we should all stop publishing informative blog posts, whitepapers, or other types of marketing collateral. The shift in how we search and create content evolved and progressed to where they are today because of Google. If it were not for them, marketers may have never developed different forms of content and collateral and the internet may still work the way it did in 2006. That is, full of helpful content that is hard to find. Google has taken many steps to improve our search experience, but here are a few standout updates they made that molded the way we published content. In 2012, Google gave us Penguin and we noticed a severe drop off in "webspam" and sites that ranked due to black-hat SEO techniques. Now, Google penalized your website for random keyword stuffing and promoting spam-like content. About one year after Google rolled out their Penguin algorithm, Hummingbird was introduced to us. This update played a huge role in the transfer to conversational search. This update improved Google's ability to take a phrase and dissect it. Instead of breaking down search queries word by word, Google started to take whole phrases and attempt to calculate their meanings. This is when we started talking to our search engine like we would ask a friend a question. In October of 2015, RankBrain is given more power and becomes the third-most influential factor in ranking a page. RankBrain allows Google to crawl your site and recognize that if someone searches for food, but your page mentions cuisine, they are alike, and your page should be provided with the results. This is huge, no longer do marketers have to continuously use the same keyword, or phrase throughout their published collateral, instead, they are actually rewarded for using synonyms and writing like real people. What does all of that mean though? It boils down to specificity. Google wants us to be able to take a topic and answer a single question, not attempt to cover a topic in its entirety. Now, this doesn't mean that your website cannot cover all of the digital marketing, but your blog post cannot. Furthermore, the odds of someone landing on your homepage will now be less likely than someone landing on a blog or whitepaper. When we create content now, we should use topic clusters, pillar content, and sub-topic clusters to help us rank higher in search results. Topic Clusters - What you want to be known for. 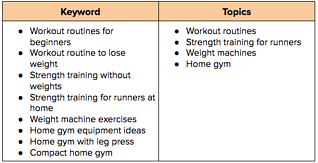 Instead of keyword variations, generalize things and think of a two - four-word phrase that can sum up what you want to talk about. For instance, Alex + Tom uses Digital Marketing as a topic cluster. 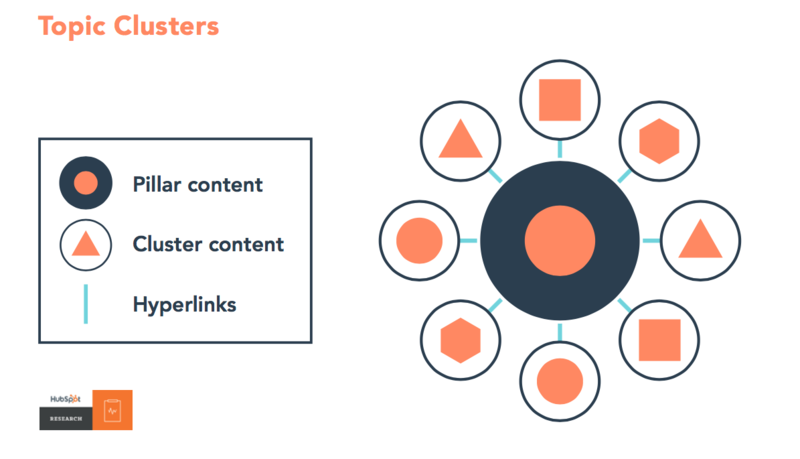 This topic cluster is now used as an idea that you can create from, but what you create within this cluster should always be founded by your Pillar Content. Pillar Content - This is the hub for all your topic clusters. Pillar content should take the form of a landing page or long-form whitepaper on your site. This is what all of your topic clusters will be enforcing. Each topic cluster will share the idea of your pillar content, even if the topic clusters don't agree with each other. Pillar content creates authority and helps users of your site easily recognize what you do and what you can offer them. Ungated - Easy for crawlers to find, digest and categorize. Comprehensive - Substantial enough to support a sales team when they are being asked questions about what you do. Related - Synonyms and like-words should be used throughout the pillar page. This will make it easier for search engines to find your content and serve it to related searches. Sub-topic Clusters - These are your blog posts, site pages, and linked material. Shorter content that will always be related to your pillar content, but answers more niche and one-off questions. Using this format, you will now gain authority in topics that are related, but not similar. This allows your site to be crawled and neatly organized by Google making it easier for them to find an answer to a question on your site. Adapting this new SEO format may take time and involve you rearranging content that is currently on your site. However, this will help you rank higher on a Google result page because Google has already started to use these concepts to crawl and serve content.